At Lotus Salon, our talented and experienced hairstylists have been working in the industry for years, and can help make your wedding a beautiful, memorable event. 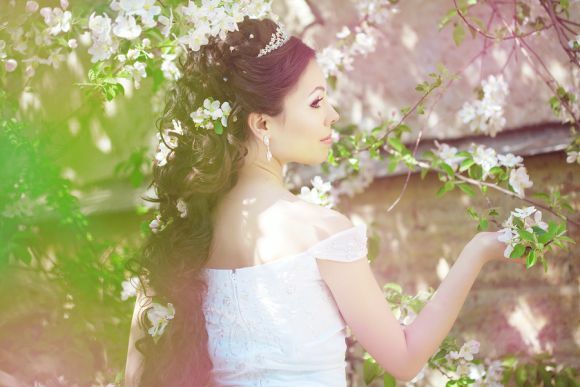 We offer a variety of bridal packages that include hairstyles, makeup, and haircuts. Our hair salon offers complimentary consultations for wedding hairstyles in Marlton , during which we discuss our services and your vision for dream hairstyle on your wedding day. We will work with you to create a chic wedding hairstyle, whether you have a short haircut, bob haircut, medium hairstyle, or long hair. Our stylists are experts at working with hair extensions, and are happy to style your existing hair extensions, or use professional hair extensions to add length and volume to your hair. At our hair salon, we can provide wedding hairstyles and makeup services for your entire wedding party. In fact, if your wedding party has eight or more members, and you schedule a salon services trial prior to your wedding day, we will do your wedding hairstyle and makeup for free on your big day.